After sustaining three injuries in the same battle in Vietnam and losing the lower portion of his leg, Jerry Donnellan lived a full life as a veteran’s advocate, and for a short time, the road manager for Frank Sinatra. The former director of Rock Vets (County of Rockland Veterans Service Agency), died in his Valley Cottage home on Friday, March 23. Donnellan recognized that returning Iraq and Afghanistan soldiers were joining a line for Department of Veteran Affairs services that includes, Vietnam, Korean and World War II vets, like my father, depicted here in Rome in 1945. Donnellan used his 25 years of experience as an advocate to led local government’s efforts to support veterans. Donnellan was also the president of New York Vets, the non-profit entity that raises the money to operate the Camp Shanks Museum. Always eager to deflect praise, Donnellan wouldn’t accept the title of museum curator. “You can call me the aesthetic custodian,” he would modestly concede. From 1942 until 1946, 1.3 million soldiers passed through Orangeburg’s Camp Shanks on their way to their deployments. Known as the “Last Stop U.S.A,” Camp Shanks was the embarkation point for 75% of the troops that fought on D-Day. He was less demur about the accomplishment that Camp Shanks symbolizes. “We were a different country before Camp Shanks was built. In the early months of World War II, we were losing. We were coming out of the Depression. We were the 15th or 16th ranked military power. The Army Corp of Engineers arrived in September 1942 and by January 1943 they put up 2500 buildings. You can’t build a deck in three months nowadays.” Donnellan declares, suggesting that this explosion of ingenuity and effort led to our victory in the World War. 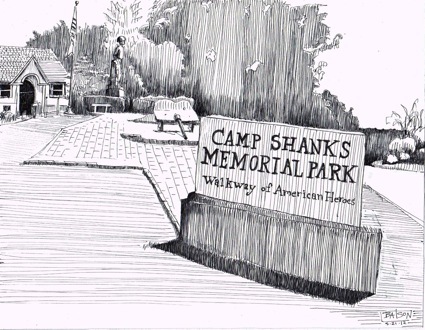 Donnellan marveled at how Camp Shanks “rose from the mist like an American Brigadoon, and then disappeared.” In 1946, Camp Shanks was converted into Shanks Village, a transitional housing facility for returning vets. With typical humor, Donnellan reflected on the irony that the soldiers who followed General Dwight D. Eisenhower into battle, found his leadership difficult to escape. Many of the returning vets who stayed in Shanks Village attended Columbia University on the G.I. Bill, where General Eisenhower was installed as President in 1948. “They must have thought Ike was following them,” Donnellan said. Donnellan described the origins of his military career in the most self-effacing terms. “I was Rockland County’s least successful draft dodger. When I got out of high school in 1964, we had advisers in Vietnam, but we were not at war. I wasn’t anti-war. I just didn’t want to get up early and roll around in the dirt. The alternative was to go to college, where there were girls, music and beer. Unfortunately, I ran out of college before they ran out of war.” He was drafted in 1968 and injured near the North Vietnam border a year later. He received three Purple Hearts for his conduct. After the war, Donnellan returned to Rockland County working as a stage manager for venues like Rockland Community College, Theater-Go-Round in Nanuet and the Westchester Premier Theater. One night in Westchester in 1976, Donnellan was drafted again, this time by Frank Sinatra. Sinatra’s road manager Bob Keirnan had to rush back to Las Vegas to help Ann-Margret stage her act, leaving Donnellan to call the show. Jerry spent the next 11 years as Sinatra’s road manager. 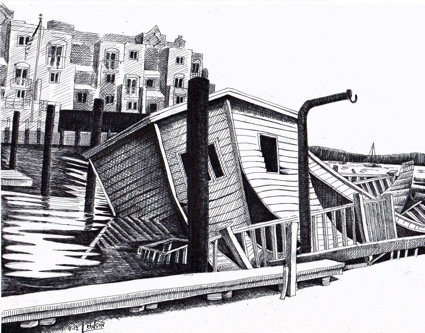 Donnellan lived for a while on houseboat that was moored at the Nyack Marina. Sadly, his floating home sank into the Hudson on October 29, 2012 when waters driven by Hurricane Sandy came surging up the river. The boat was not Donnellan’s primary residence. Donnellan and his wife Mari Ellyn had a house in Valley Cottage. Just as sure as there are super storms on the horizon, there will be armed conflicts in our future. We would be fortunate if one in every thousand who answer the call of duty have half the humor and humility of Jerry Donnellan. That would make the future of our country and our communities, no matter what comes, more secure. An activist, artist and writer, Bill Batson lives in Nyack, NY. 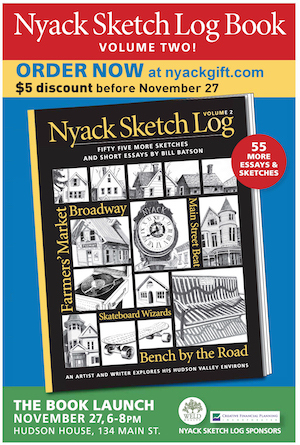 Nyack Sketch Log: Jerry Donnellan 1946 – 2018 © 2018 Bill Batson. Visit billbatsonarts.com to see more. 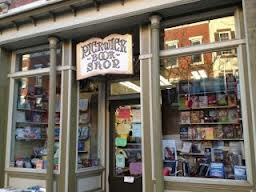 Nyack Sketch Log notecards are now available at Koblin's Pharmarcy and Pickwick Book Shop.